Home / News / Four more projects launched! During the last quarter of 2017, four of our partner projects held official launch events. 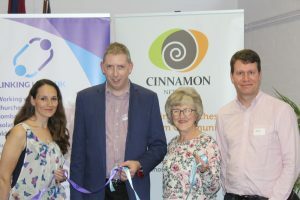 It started on 1st October when around 200 people attended a tea party to launch our partner charity – Befriended – in a school hall in Burgess Hill, Mid Sussex. Entertainment included singers andÂ dancers of all ages and styles and the Bishop of Lewes, Rt. Revd. Richard Jackson, carried out the official launch and commissioning of volunteers. (See photo above). Soon afterwards on 11th October was the launch of ‘Leicester Western Ward Linking Lives’. We were entertained by a very talented children and young people’s singing group and we helped to tie (as opposed to ‘cut’) a ribbon to represent the building of relationships in the local community! 18th November saw the launch of Brent Linking Lives (at Harvest Church, in the shadow of Wembley Stadium!). A very moving audio recording of a ladyÂ explaining how her visitor had literally kept her going over recent months,Â led to boxes of tissues being circulated around the room! Even the mayor, who went on to carry out the official launch, publicly offered to become a volunteer! 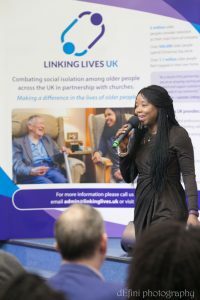 Four days later, Linking Lives Eastbourne was officially launched after beginning the project in November 2016. Around 40 people from churches across Eastbourne attended a special service to launch the project including leaders from seven local churches. The Bishop of Lewes was again called upon to pray a blessing on the work and all those involved and has also agreed to be patron of both projects.